The verdicts on the second group of defendants in the Bolotnaya Square case will be announced in Zamoskvoretsky Court in Moscow on August 18. 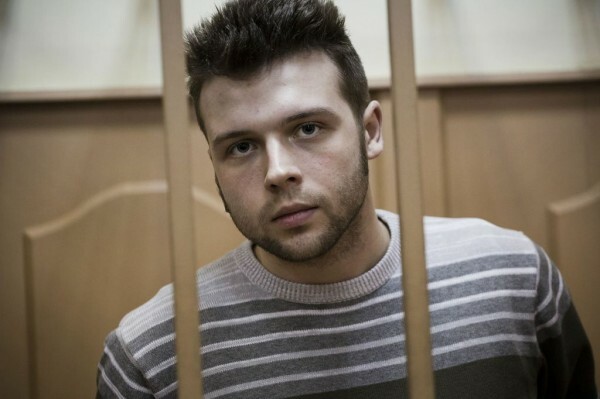 The prosecutor asked the court to sentence Alexander Margolin and Alexei Gaskarov to four years in prison; Ilya Gushchin, to three years and three months in prison; and Elena Kokhtareva, to three years and three months suspended, with four years of probation. All four defendants have been accused under Article 212 Part 2 (involvement in rioting) and Article 318 Part 1 (use of non-threatening violence against a public official) of the Russian Federal Criminal Code. 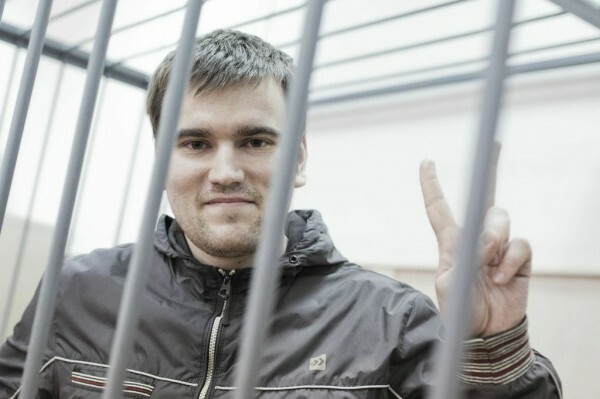 On August 4, 28-year-old antifascist Alexei Gaskarov made his closing statement in court. This is the complete text of his speech. The so-called Bolotnaya Square case has been symbolic in the sense that through it the public sees how the authorities interact with the opposition, with those people whose viewpoint differs from the general line. The first thing I wanted to talk about is something that was not addressed in the trial, but which I think is important: why on May 6, [2012,] despite everything, so many people decided to be involved in certain events, rather than simply stand another two or three hours in queues, and ultimately did not permit themselves to be beaten with impunity. The May 6 demonstration was the seventh major event staged by the opposition [during the 2011–2012 fair elections protest movement]. Whereas earlier, before December 2011, a few thousand people attended protest rallies I had witnessed, when you-know-who said the idea of rotating governments was not the best thing for Russia, the core group of protesters increased significantly. And these people did not go organize riots, but went to observe elections in order to understand and record the way the political processes that occur in our country are legitimated. Everything fell into place on December 4[, 2011, when parliamentary elections were held in Russia]. Despite the fact that the institution of elections had been destroyed much earlier, the large group of people who went to the polls as observers saw how the legitimacy of the current government was shaped. I myself was an observer at those elections, and what we saw was quite straightforward. Indeed, it is a strange situation when you are trying to find at least one person among your acquaintances who would say they voted for United Russia. In fact, such people did not exist: there was no mass support for the government. When they tried to counter the Bolotnaya Square protests with an event on Poklonnaya Hill in support of the current government, they could not gather more than a thousand people. This subject itself was extremely important, but unfortunately it was not sufficiently popular with the authorities. Fair elections are still the only legal way of changing the political system, and once it has been changed, you can solve social and economic problems. A huge number of people took to the streets. There was almost no reaction on the part of the authorities. The protests were peaceful, the protesters were numerous, and it was obvious the demands they made and the problems they talked about were real, but instead we saw only a reluctance to engage in dialogue and, at some point, flagrant mockery. 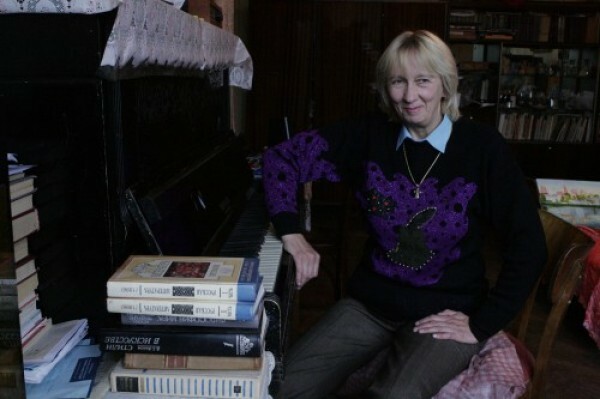 A lot of people now do not like what thuggish characters in Ukraine are calling people from Southeast Ukraine. But here in Russia the same thing happened: when people came out on Bolotnaya Square, the country’s president called them Bandar-log and made many other unflattering comparisons. We were told we amounted to only one percent, that only one hundred thousand people in a city of ten million came out to protest, that it meant nothing at all. But later, when they actually allowed a fair poll, as happened during the [September 2013] mayoral election in Moscow, it turned out it was not one percent, but forty percent, a significant segment of society. And I would like to say that we should be glad on the whole that the events on Bolotnaya Square happened as they did. In all developed democratic countries, protest rallies, the opportunity to express points of view that differ from that of the authorities, generate political competition, which enables countries to find the best way of developing. By the way, certain problems in the Russian economy began precisely in the third quarter of 2012, because it is impossible to build a stable economic and social system when you completely demotivate and exclude such an essential part of society. And it was obvious that this part of society was essential. The first signal that comes from our case: does the right to protest, which exists in all developed countries, exist at all in Russia? As we see now, Russia has been deprived of this right. And the second signal, which it is impossible to ignore: has the rule of law survived in Russia? Individuals must be protected from the actions of the authorities not only by a system of checks and balances but also by the possibility of appealing directly to the law in the way in which it is worded. I think this can be seen in our case. There is Article 212 of the Criminal Code: it may be poorly worded, but it is worded the way it is. And it is wrong, I think, to raise such obvious questions at the trial stage, because the law is worded quite clearly. We read a lot of commentaries to the Criminal Code and nowhere did we find that the corpus delicti of “rioting” could be defined alternatively, based on the evidence listed in the charges. Nevertheless, this has been consistently ignored. Even in those decisions entered into the case file, this subject was roundly rejected. In and of itself, the rule of law is the most important of the institutions that protect the rights of individuals from the state. And, of course, we cannot ignore the selective application of the law to citizens. I realize that Russian law is not based on precedent, but it is impossible not to notice that if, for example, you are a nationalist, block roads, and set fire to shops, but refrain from speaking out against the actions of the authorities, you are only guilty of disorderly conduct. If you go to protest rallies where people shout, “Putin is a thief!” you are, accordingly, liable to serious criminal charges. But it seems to me this way of posing the question dismisses and completely destroys any criticism of the government. We cannot forget that many terrible things have happened in our country (for example, during the Great Terror [under Stalin in 1937-38]), that people in uniform committed all these crimes, and everything they did was legal for all intents and purposes. But now they tell us there should be no critical rethinking of this situation, that it is necessary to stupidly obey the thesis that was endlessly repeated during discussion of our case. The main thing I would like say, your honor, is that I really would not want it to happen that, after our trial, speaking of the law as an expression of the principle of justice became a sign of bad taste. I would hope that our trial did not pursue any other political objectives that have been imposed on it, that have been set for it—and all that is in the case files—but that we be judged for the things we really did. But if, in this country, the way to freedom runs through prison, we are ready to go. That is all. Originally published, in Russian, at Grani.ru. Photos courtesy of Bolotnoedelo.info. 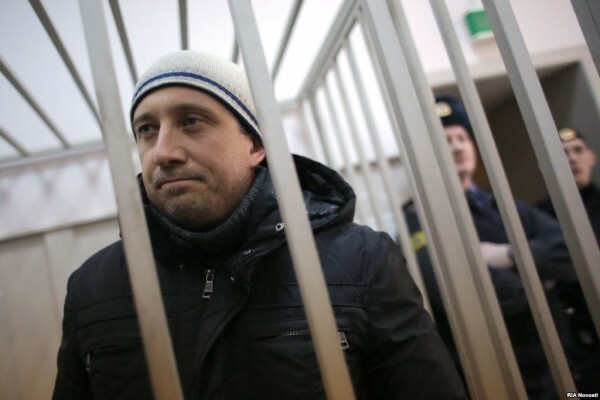 On July 24, two other defendants in the Bolotnaya Square case, the left-wing activists Sergei Udaltsov and Leonid Razvozzhayev, were each sentenced to four and a half years in prison on charges arising from the May 6 demonstration. Supporters of Alexei Gaskarov and the other three defendants being sentenced this month fear similarly harsh penalties on August 18. Solidarity makes a difference in such cases. While the Russian government claims to be championing “antifascism” in Ukraine, it is sending antifascists and other oppositionists in Russia to jail for long periods. The more support for these activists from antifascists internationally, the better. Please copy and republish this article; demonstrate or protest however you can; write to the Russian embassy; and look on the Free Alexei Gaskarov site and the May 6 Committee site. Update. On August 18, Alexei Gaskarov and Alexander Margolin were sentenced to three and half years in prison; Ilya Gushchin, to two and a half years; and Elena Kokhtareva, to a suspended sentence of three years and three months including three years’ probation.